I love reading blogging tips posts, so I am going to write my own as I hope some of you will find them interesting. Today's is going to be based on starting a blog, so for anyone considering starting their own blog, I hope this is helpful! When you first decide you would like to write your own blog, decide what it is going to be based on. This could be absolutely anything you like, such as beauty, fashion, travel, cooking or lifestyle. I think it's important to be truly passionate about whatever you will be writing about. Your passion will shine through in your posts and you will find it easier to write if you are passionate about the topic. You will then need to decide on a name. I would do this after you have chosen your blogging topic, as the name could reflect this. 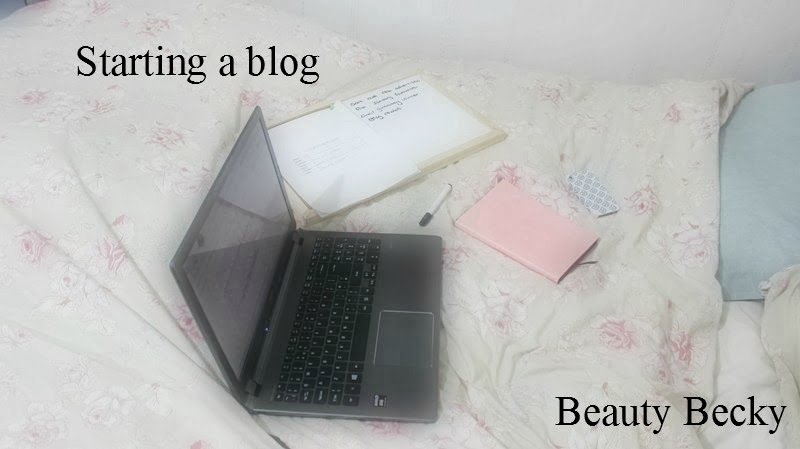 For example, my blog name is Beauty Becky, which lets people know my blog is predominantly based on beauty. I would recommend not including lots of numbers or punctuation and just keeping it simple so it's easy for people to remember. Once you have decided on your name, it's time to create your blog! There are various blogging platforms such as Blogger and Wordpress. I personally use Blogger and have had no experience with Wordpress. You may find that the name you have chosen is already in use and therefore unavailable, so I would recommend having a play around with the words and order to find an available one. Now that your blog is created, I would also create your social media platforms. It's nice having the same name for everything, so even if you aren't planning on using social media, its a good idea to create an account with your blog name so you have it for future use. All of my social media accounts are beautybeckyblog, which makes it easier for people to remember! Finally, I think it is important to start a blog with the right expectations. Start blogging because you have a passion and an interest in it. Don't start with the intention of receiving free PR samples, being invited to events or getting lots of followers. This can all take time and having true passion and commitment will show through in your posts. I hope you have found this interesting! My second blogging tips post will be up soon, so keep a look out for that. Some great tips for people starting out with Blogging. I wish I'd have been able to read something like this when I first started up my blog, although after months of recent research and reading tips and tricks, I think I've managed to turn it around and now receive regular visitors. Yay!